Betty Jo Greer Clark, age 94 of Pikeville, Kentucky passed away Thursday, November 22, 2018 at the Pikeville Medical Center. 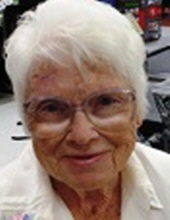 She was office manager for Dr. Orville Mayo Clark Jr. Optometric Office, a member of Beta Sigma Phi and a member of the First Baptist Church of Pikeville. Betty Jo was a born at Shelby Gap, Kentucky on March 19, 1924 the daughter of the late C. C. Greer and Grace Ison Greer. Along with her parents, she was preceded in death by her husband, Dr. Orville Mayo Clark Jr. on February 14, 2018. She was also preceded in death by one daughter, Gina Lyn Clark Ratliff and a brother, Jack Greer and three sisters, Alka Wright, Mabel Stallard and Lucille Martin. She is survived by one son, Dr. Orville Mayo Clark III of Pikeville and one daughter, Alicia Clark Herr (Art) of Pikeville and a son-in-law, Jeff Ratliff of Pikeville. Two sisters, Barbara Alt (Bill) of Lexington, Ky. and Jenny Cheeks of Bradenton, Fla.
She is also survived by five grandchildren, Gatlin Clark (Lydia), Kellsy Clark, Whitney Hamilton, Tiffany Ratliff Skeens (Willie) and Taryn and five great-grandchildren, Madison, Lily Grace, Cruze, Slade and Syler. To send flowers or a remembrance gift to the family of Betty Jo Clark, please visit our Tribute Store. "Email Address" would like to share the life celebration of Betty Jo Clark. Click on the "link" to go to share a favorite memory or leave a condolence message for the family.